The Bellingham Branch of the Mountaineers, offers a Basic Mountaineering Course will teach you the skills needed to safely get on top of higher ground via rock, snow, and glacier travel, through moderate to difficult terrain. You will learn how to evaluate weather, alpine hazards, and snow conditions to make sound decisions about when and how to travel in the high country. You will also learn Advanced Alpine First Aid in order to minimize the potential for an accident and provide the first response to incidents in the backcountry. Additionally, you will learn equipment selection and use, climbing knots, rope management, navigation, route-finding, and basic avalanche terrain evaluation. 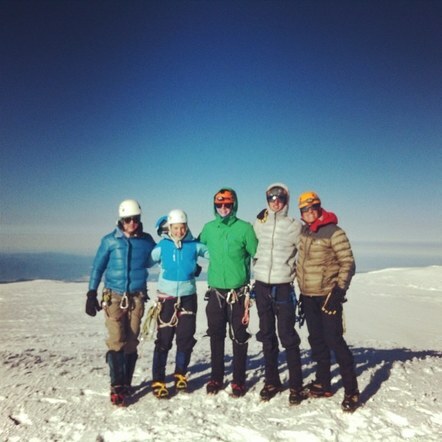 To expand upon this solid foundation, you will learn basic rock climbing techniques such as following a lead climber, and basic snow and glacier travel techniques such as self arrest and rescuing a fallen climber from a crevasse. This course will teach you how to be a valued team member to foster mutual trust amongst fellow climbers. The course emphasizes safety, providing students with the confidence and knowledge they need to get to high places that once seemed unattainable. The Bellingham Branch of The Mountaineers offers a balance of respect, safety, encouragement, team building, and challenge to result in a fun and educational experience. The course will have a mandatory field trip to Canada. Wilderness First Aid is required to graduate. Students who do not already have a Wilderness First Aid certification can take a Mountaineers Wilderness First Aid Course. Apply or Learn More at www.BellinghamMountaineers.com!